Set in the Irish town of Ballinacroagh, Pomegranate Soup follows the lives of three Iranian sisters; Marjan, Bahar and Layla Aminpour. Since fleeing Iran during the revolution, they have found sanctuary in their new home. Ballinacroagh gets a cultural shake-up as the Aminpour sisters open Café Babylon and introduce the intoxicating spicy aroma and flavours of Iran to the land of boiled cabbage and Guinness. What ensues is heart-warming, as Marjan and her sisters find new friends and turn their host country’s culture shock and its objection to the unknown into the joy of new discoveries. The sisters’ happiness is soon hampered when their dark past in Iran seeps into their present. 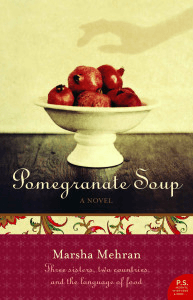 Pomegranate Soup is a fine novel, showcasing the cultures of two countries as different as night and day and how they reconcile because of three young girls and their hunger for a new lease on life. 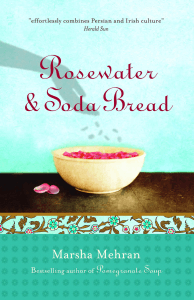 Following the success of Pomegranate Soup, Rosewater and Soda Bread continues to chronicle the lives of sisters Marjan, Bahar and Layla Aminpour. Life is well and Café Babylon continues to fascinate the once humdrum Ballinacroagh. But conflict soon arrives on Clew Bay Beach in the form of a strange young woman bearing webbed hands and a past that proves an unimaginable upheaval for the pious Catholic town. As the Aminpour sisters lend support to the newcomer, they deal with dilemmas of love and spiritual belief. Rosewater and Soda Bread once again bears Mehran’s distinctive cross-cultural anecdotal style; with Iranian culinary magic maintaining a strong thread throughout the backdrop of Ballinacroagh. Mehran’s final and posthumous literary masterpiece takes readers to Buenos Aires, during the Falklands War. A group of Iranian refugees find shelter in a building with a Beaux Arts structure. Amongst them, an ex-prisoner, a young hairdresser, and a newlywed couple; they begin to find comfort and inspiration in weekly poetry meetings and intimate storytelling. In time, they find themselves becoming an adopted family of sorts, brought together by a revolution stirring in Iran. 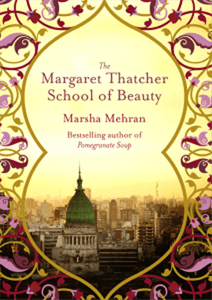 The Margaret Thatcher School of Beauty will be published under the new title The Saturday Night School of Beauty in the UK and USA in September 2015.